I've been doing a lot with poached eggs lately, mainly for breakfast. This creation stemmed from decided everything "breakfasty" was out of the question. Oatmeal? Too Dickens-esque. Pancakes/waffles? Too sticky. Muffin, scone? I don't feel like baking. In fact, I just didn't want anything sweet, so I set out to quickly come up with something other than scrambled eggs or an omelette. For this dish, I sliced up an jalapeno and garlic, then heated up a skillet with olive oil while I sliced two corn tortillas into strips. Once the oil was heated, I sauteed the jalapeno a bit before adding the corn tortillas with some salt, and turning up the heat. A bit before the tortillas reach your desired crispiness, add the garlic. Remove from heat and stir in however much baby spinach you want. Place in a bowl. Meanwhile, poach eggs. To do this, I bring a pot with enough water for the egg to be submerged (maybe 2-3 inches of water?) just to a boil, add a splash of vinegar, and lower the heat to just a simmer. From a small bowl, pour the egg into the pot after you use a spoon to stir the water. For the next 1-2 minutes, just don't touch the egg -- if you leave it alone, the egg white folds on top of itself and it's less messy. After the 1-2 minutes, you can start to gently prod the egg with a slotted spoon in case it's sticking on the bottom of the pot. After 3 minutes, remove to a paper towel-lined plate and gently pat dry. 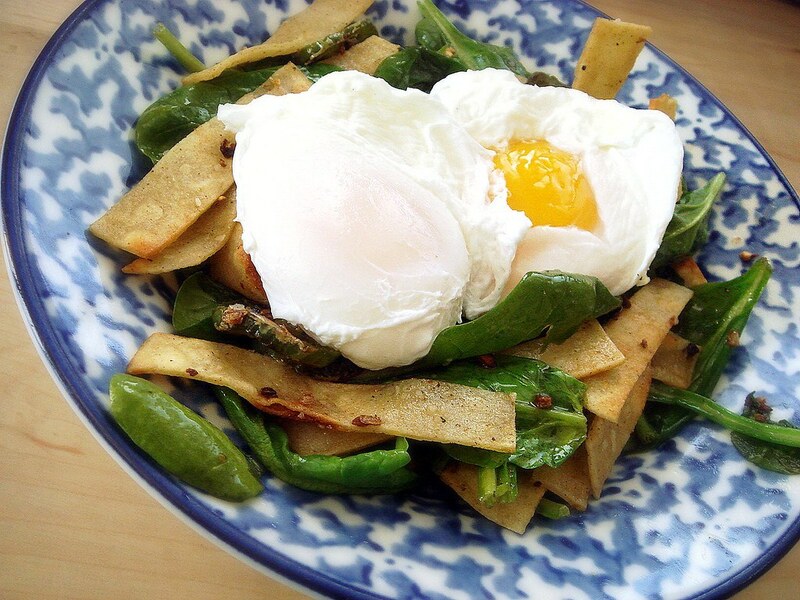 Place on top of tortilla-spinach bed, season with salt, and eat. And that's it. Super simple, quick, and a bit different than what you might normally have for a breakfast. This would also make a great dinner for evenings when you're wiped out. I made a great spinach-jalapeno white sauce that would be lovely drizzled on top if I wanted to make this a bit heavier. Tazo Tea and Summer Beach Pack Giveaway Winner!